The World War II German Enigma encryption machine and the successful Allied effort to crack it are fascinating pieces of modern history. Surviving Enigma machines are a rarity and amongst the most rare is the Kriegsmarine (Reich’s Navy) model M4 of 1942. In the Battle of the Atlantic and in the North Sea the German U-boats had developed the Wolf Pack strategy to maximise their destructive impact on Allied shipping and to protect themselves from detection and destruction. Secure communications were a basic essential though not enough in themselves. In order to transmit a signal a U-boat would have to use radio transmission, and that radio transmission could be detected by use of direction finding apparatus on enemy ships (two being necessary to triangulate and locate the transmitting ship). So the source of the transmission could be located and the U-boat attacked. Germany’s Kriegsmarine were acutely aware of the dangers of communications and did their level best to minimise the need for radio communications. A good source of information on the cat and mouse game between the German Kriegsmarine and the Allied navies from the German perspective can be found in Cajus Bekker’s book “Hitler’s Naval War”. It is a fascinating book that is long out of print but copies can still be found on Amazon at delightfully low prices. You will find “Hitler’s Naval War” on Amazon if you click here. 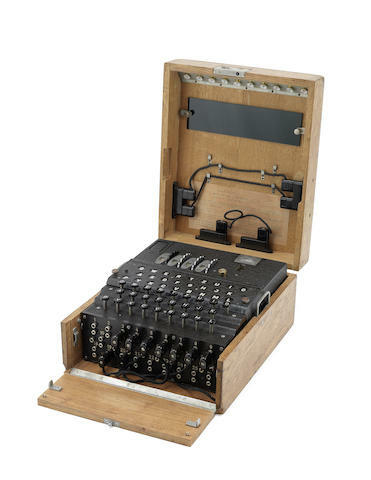 The M4 Enigma machine was ordered by Admiral Doenitz in 1941 when he surmised that the M3 Enigma machines of all German U-boats had been compromised by the capture of U-570 in August 1941. Deployment of the new M4 Enigma machines to U-boats was quick and thorough. Of the German armed forces it was the German navy that implemented the most strict set of procedures and encoding practices to guard against their enemy being able to discover such fatally important information as refuelling rendezvous, assembly of Wolf Packs and convoys to be targeted. So the Kriegsmarine did not entirely depend on the Enigma machine encryption but implemented additional security measures, including measures that would ensure that message radio transmissions could be kept as short and terse as possible. In order to accomplish this the Kriegsmarine created a Kurzsignalheft (meaning short signal codes) where four letters represented a longer message. Using the Kurzsignalheft complex information regarding refuelling, assembly of Wolf Packs, enemy ship positions and ships involved, and weather conditions etc. could be accurately, but tersely communicated to minimise the opportunities afforded the enemy to get an accurate radio direction finding location for the transmitting boat. The M4 Enigma machine being offered by Bonhams at their “Conflicts of the 20th Century” auction coming up on Thursday 21st October 2015 is going to be well out of the price range of most of us who might be interested in having one of these rare working examples of an M4 Enigma machine as a conversation piece in our home. For those who might be interested in acquiring this Kriegsmarine M4 Enigma machine you will find the Bonhams auction page if you click here. And for those of us who don’t have a spare few hundred thousand US dollars to purchase an actual Enigma machine we can have the virtual Enigma machine App from Amazon if we click here. For those of us interested in history and the story of the cracking of the Enigma we’ll find Alan Turing’s book “The Enigma” if we click here. And for those who are less interested in history and more interested in drama and popular culture you’ll find the movie “Enigma” which is loosely based on the history, produced by Mick Jagger and “Saturday Night Live” creator Lorne Michaels; starring Dougray Scott and Kate Winslett, and directed by Michael Apted if you click here. 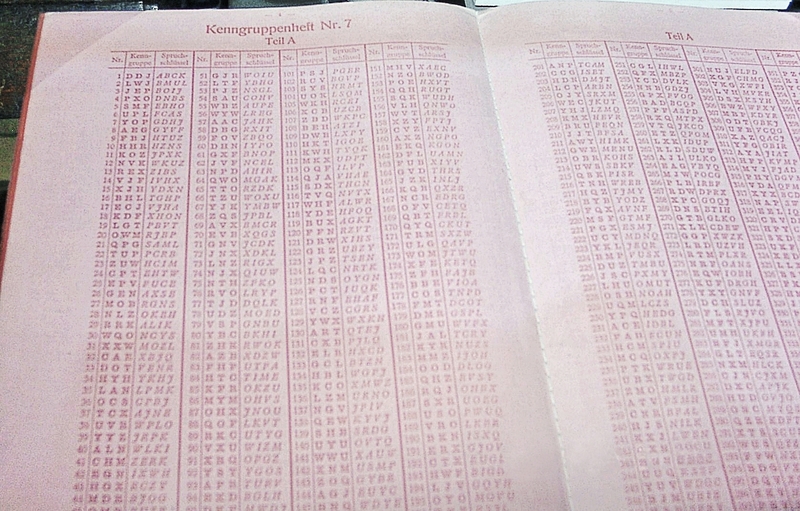 An Enigma codebook recovered from the captured U-505. (Picture courtesy Wikipedia).